At Texas Foot Specialists, one of the experiences we find most painful is seeing a patient who has a foot or ankle injury and didn’t come in for treatment when the injury first occurred. In order to achieve the best possible recovery for a foot or ankle injury, two components are necessary: starting treatment immediately and rehabilitating fully. In cases where a podiatric injury is not clearly an emergency situation, we find patients usually wait too long to come in. The problem with foot and ankle injuries is that they can be difficult to diagnose and monitor if you are not a podiatrist. You may have a fracture and still be able to walk on your broken foot. An ankle sprain may start to hurt less when it’s actually getting worse. Our podiatrists, Dr. Gregory Mangum and Dr. Bruce Miller, will examine your injured foot or ankle and know the appropriate tests to perform to diagnose your injury. They can have x-rays done right in our Pasadena (281) 991-0600, Sugar Land (281) 242-4448 or Houston (713) 664-6677 office and quickly determine if you have a fracture, sprain or other injury. Once an accurate diagnosis has been made, the foot doctor can get you started on the right course of treatment to heal and rehabilitate your injury. REST—don’t continue to bear weight on an injured foot. Stay off of it until you can be seen by the foot doctor. ICE—using ice on the injured part of your foot will bring some pain relief and also help control swelling. Apply ice for 15-20 minutes at a time, every three or four hours. Do not apply the ice directly to the skin. Wrap it in a thin towel or use a plastic bag. COMPRESSION—wrap the injured area with an elastic bandage to control swelling and help immobilize the section that is hurt. The wrap should be snug but do not make it so tight that it cuts off your circulation. ELEVATION—keep your foot propped up at a level higher than your heart to help decrease swelling. 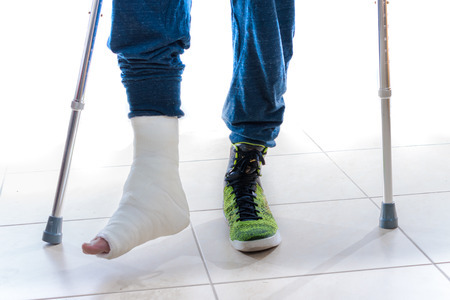 If you have sustained a foot or ankle injury, contact us as soon as possible.